Right&Above received a requirement to build a prototype of a bracelet-like device that could perform some tasks commonly handled by mobile phones. The challenge was to make this wearable solution light, but full-featured and capable of accessing the user’s Twitter and Facebook data from any place they go. Inspired by the idea to build a handy tool that could bring Social Media communication to a new level, our team started working on a prototype for the future-proof touchscreen bracelet. The silicone prototype we implemented features GPRS connectivity and an OLED screen with Embedded Touch Pad. Our team implemented the back-end to allow social media connection through a proxy. The device connects to a server within a predefined period of time specified in the firmware and checks for new messages. 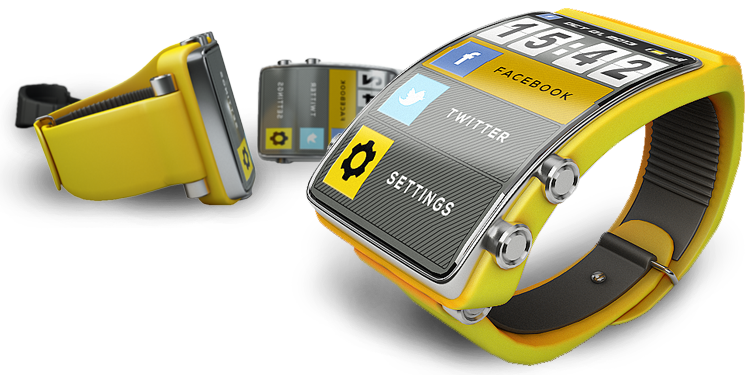 Users are able to receive regular interval and on demand messages and status updates on the bracelet and reply with custom or predefined messages which are either entered directly with the touchpad into the device or downloaded from the server and then selected by the user with the touchpad through an intuitive User Interface. A secure messaging between Bracelet and Application Server is based on symmetrical encryption/decryption algorithms. Both sides have to use the same secure key. The device contains GSM Module which communicates with a proxy via GPRS Protocol. Navigation and control are implemented via touchscreen, as the concept of an on-screen keyboard is based on the capability of an OLED screen to handle touch events. To store the data, there is an additional external 32Mbit flash memory. The bracelet is also supplied with a rechargeable battery for its long run. Micro USB connector is used to charge the battery and load the firmware to the controller.